Whatever you may have heard about Affiliate marketing, may be true and some may not be. There is a great deal of misinformation online now about it. 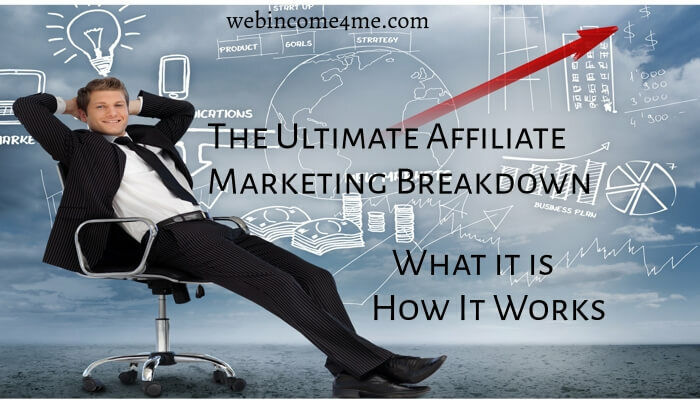 Follow along with me and I will explain Affiliate marketing what it is and how it works. How about we start from several years ago, when I was just getting started online back in 2004, I had a retail website selling memory foam and latex foam bedding material. I had heard about affiliate marketing which was still sort of a new concept at that time, just a few years in. I chose not to do use it on my website at the time mainly because I knew very little about it. I was running online auctions on eBay and my website, I had multiple suppliers and my business was set up as a drop shipping business. Lets just say I wish I a new then what I know now, as yes my business was making a profit but not to the extent that I had hoped and I also had to manually process every transaction from a customer by purchasing at cost price from my supplier and have them send it to my buyer directly, I kept the difference between the final price and the cost from my end. So you are probably saying, I thought this was about affiliate marketing. It is. The reason I am explaining my situation above is to help you understand the scope of a business model and allow for a comparison to affiliate marketing, so you can understand how it works. How about we get to it. Let’s say for example that you have an interest in stargazing and would like to promote the right type of telescope as an affiliate. You have many options for suppliers but for this, just search for Telescope affiliate programs and you will see many pop up in the search. Each program normally has an agreement you need to accept and when you get approved you get access to marketing materials like banners, videos and you get an affiliate link, that has your affiliate id in it which gives you the credit when it is clicked. So what you do is use the marketing materials or create your own and use your affiliate link, add content that shows value to your readers and you promote it via social media, a website, a blog, Pay Per Click marketing, Email Marketing among others. You get compensated by your supplier that you are affiliated with when a sale results from your marketing efforts, in the amount of 1%-75% normally depending on the item and supplier. Sometimes the same supplier might have different commission rates for different items, that’s normal. So Let’s say you are promoting those telescopes from above and they are selling for $350 a piece, that is the retailer that sets the price, not you. You get people to by 10 of them at 5% commission rate. That is $175 for you. Not bad. See how it works? It is a cycle that keeps going, that is why affiliate marketing can make money for you when you are not online at the moment. Some method you used to promote your item generated a sale so you get credit. The world wide web is just like it sounds, Worldwide, so you could be sleeping and wake up to find out you made money. A nice perk. Affiliate programs are free to join and promote, there are a few that may have small fees associated with them but I would shy away from them because you are doing the retailer a favor by promoting for them, there should not be any fees or cost for you to be an affiliate. Your costs happen with the set up of your online business, the hosting of your website, for example, is a cost. Normally pretty cheap per month but still a cost. The other cost would be the program you use to get the training you need to make this work. Legit training programs will be set up in a way that provides you with information before you sign up, so you get an idea of how it works, many have free trials. Avoid the ones that make you pay $1000’s up front and even more later. That is silly and also a scam. There are some great training options today that have a total yearly cost for the training that does not exceed $400-$600 a “year”. The difference in most good programs is what they offer for the price. Some have marketing tools, like keyword tools and content management systems to help you out and others just have the training and make you search and pay for the rest. The other difference with what is offered today is the quality and relevance of the training provided. Some not so legit programs charge quite a bit for old videos and outdated training. Wealthy Affiliate– I start here with them since I believe from what I have seen since being a member for nearly 2 years now is that they are the industry leaders in all things affiliate marketing and even just online business related, There are tools provided for you to use to do Keyword research and write your content for your website. Cost – Free Membership or $49 a Month Premium Membership- or go yearly for $359.- This covers the entire platform of services, 120 Step By step training courses and additional members training and Several industry-leading tools and helpful information to get you going. This also covers web hosting for your website and the websites to go with it. The free starter membership covers quite a bit and provides the websites and hosting as well. There is no hidden agenda here, the costs are what they are listed. – See My Review of Wealthy Affiliate Here for more detailed information. A pay as you go video training option that covers just about anything you can think of they are purchase as you go type and also free courses as well. They can be long and informative for what you are looking for. They lack the tools like the other 2 programs So that will be up to you. Please feel free to verify these costs for all the above with your own research, they could change. Affiliate Programs and Networks- What’s The Difference? So we have talked about affiliate programs, but what about Affiliate Networks, What are they? There are several forms of compensation you can benefit from by becoming an affiliate. Research the specific program you are interested in and find out the payment structure so you know what to expect. Many of them only pay out after you have achieved a specific threshold of rewards. I am part of an affiliate program that pays out for anything over $50 that I have accumulated from sales. That is just one example, another pays out after $8 accumulated, so you just need to find out what the rules are and understand how the structure works and you will be fine. Hopefully, you have an understanding now of affiliate marketing and the process of how it works, the potential is amazing. You do need to know however that this is not an easy ride, there will be setbacks and frustration along the way, that’s normal. This business has a high failure rate. Why? 2. Impatience- This business takes a while sometimes months to really start to see good traffic and profits. Most people give up before they should. You will have to work for it and work hard at learning new skills and techniques to make your content stand out from others. To get started I recommend either of the 3 places I have listed above or research your own program but be wary of platforms that tell you very little and want you to pay before trying it out. As a newbie, you should try one of the free trials and see if it works for you. I would seriously like you to consider taking a look at Wealthy Affiliate, use the review link from above or you can see my post below. Just click the button to read it. Thank you for stopping by today and I really hope I helped you understand this, I would be happy to answer or respond to any comments you have about this article below, Comments are a great way for others to learn from experiences people share. Hy my name is Kashif Latif and i am new in this field i mean to say in affiliate marketing and for this purposes i have make a blog and now i am reading your article this is very helpful for me and for my blog. Hello Todd, great info on Affiliate Marketing. Affiliate Marketing is the easiest way to earn consistent income online. Wealthy Affiliate teaches you all of the necessary steps to become successful from home on your computer. I recommend this program for anyone. Thanks again, and I wish you the best of luck within the online business!!! Yes affiliate marketing is a great source of online income if done properly. Thanks for the validation about Wealthy Affiliate. They are just one of the ones I listed but I honestly feel based on feedback and research and my own personal experience that they have the best offer for folks getting started. I wish you great luck as well. That’s why I love affiliate marketing and I started a business based on it! Everyone gets happy. And you can work from anywhere in the world. How cool is that? Yes it is very cool to have portable income. The online commerce world is growing faster every day and getting on board with your own source can provide the security we all want from it. You are correct the end user is not effected by the affiliate transaction, so everyone wins. Thanks, Todd for taking the time to write a thorough blog about Affiliate Marketing. I started researching this industry while looking for ways to promote my own online business. People with little understanding of what affiliate marketing is view it skeptically but it is a legitimate way to make money. Many are surprised to find that most major retailers have affiliate programs such as Home Depot, Walmart etc. I’ve been going back and forth between WA and Affolorama. The latter’s costs are much higher and I fail to see that its training is any better than WA’s. I especially prefer WA’s live training sessions and especially the live 24/7 forum feature. You don’t find that very often. It is a very informative article and straight to the point, with great insight. To a newbie or those of us being scammed and tired, who really needs what is working and worthy of a trial. For those who do not want to follow blindly, these should be the start. I am glad you found vale in our post. I tried to lay it out so someone could see the potential with affiliate marketing. Yes a free trial in whatever program you decide on should help make the decision easier. The options I mentioned are not scams, so that can ease fears a bit for folks concerned about that. Affiliate marketing seems to be a safe way to generate online income today as the only investment we have to make is with the hosting of our site, and sometimes, membership like you said about Wealthy Affiliate. It is nice to have a place that keeps the fees to a minimum for your online business needs like Wealthy Affiliate does. One cost covers everything, nice perk. As far as crypto affiliate programs they are everywhere. Just a quick search in google for crypto affiliate programs will get you in the right place. Places I know off hand? Coinbase offers an affiliate option they pay you in Bitcoin. Changelly is another nice one with a 50% commission ongoing in relation to the people you send there and also part of the profits those folks make as well. Kind of a sweet deal. Localbitcoins is another one. There are a ton of them now, and it is a good idea to get in on the fun. Crypto is here to stay and getting in on that market can pay off.